On a pleasant August Night, in 1947, India’s First Prime Minister, Pandit Jawaharlal Nehru, declared India as Sovereign Independent nation, with a fervent speech talking about the India’s Tryst with destiny. The speech became a hallmark of Indian Polity on post-independence world. 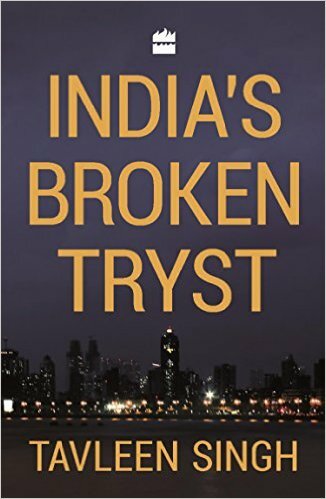 Tavleen Singh, noted writer and political commentator, who like most of us, borne post-independence, three years after the Independence of India, in her book “India’s Broken Tryst’ refers to the sixty-years of mis-governance which peeled off whatever hope and pretense of glory we had in us. This is not a voyeuristic insider report, which I had expected when I picked the book. To be honest, I expected some first person account of the mechanization of 10 Janpath, which are increasingly becoming visible with the defense scams coming to fore with every passing day. This book actually cuts too close, too near the author. It opens with the Raid of Enforcement Directorate, the house of her partner, Ajit Gulabchand, the man behind Lavasa. A writer’s nearness to the narrative which is too close to the author can cut both ways. The same nearness which brought immense credibility to Emergency by Coomi Kapoor, in this case, somehow makes on fearful about prejudices interfering with the writer’s account. 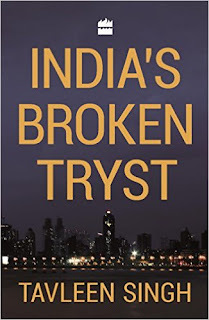 As a partner of Infrastructure tycoon, wronged by a vengeful government which would not hesitate to adversely impact the larger population’s interest, she seems to find key solution to all the ills in infrastructure. She mentions infrastructure and urban development as a panacea to all ills at many places in the book. This seems too simplistic and too naive, more so, because the subject appears to be too close to her life to be considered impartial view. Congress stalled the Lavasa project, conducted raids at Tavleen’s house, got her column discontinued in Indian Express by putting pressure on Shekhar Gupta. Going by the ways Governments work under the guise of the custodian of democracy, her insinuations might be all true. However, they are never more than implications and hearsay. Friends meet in cozy, five-star lobbies and disclose the conspiracy. The state as autocratic agent of dictatorial tendency was very obvious in Emergency. One need not have friends in highest echelons of power to notice the vengeful face of power. It was in your face, as Coomi Kapoor’s husband was thrown into the Jail for upsetting Ambika Soni (I could no longer see her with seriousness when she came on TV talking about the danger to democracy in Modi's Rule vis-à-vis Uttarankhand and otherwise), Raid on Subramanium Swamy’s house, the torture of George Fernandes during emergency. It was not so-and-so told so-and-so when they met in a lavish marriage in a farmhouse. The facts did not need the intentions of the writer for the proof of their authenticity. This is not the case here. One wanders into the search for intentions, for instance when Sonia Gandhi confronts the writer for hating her. Even the emergency of the 70s, which in my opinion was the darkest path that India as a democracy has traversed, is merely a fleeting mention. Possibly a privileged background and an affluent Lutyen’s address left Tavleen rather unscathed during the 70s, emergency did not impact her as much as Lavasa did. Even with this sore miss, which to me was the biggest broken tryst, the book stands out for truth. Tavleen not for a moment pretends to be what she is not. She is honest enough to mention that she did not go to get the kid from the street picked by the Police released as it was too late at Ten-thirty, without taking, well, poetic liberty on how she tossed in the bed thinking about the poor boy. She doesn’t hide that she stays in Taj during election coverage in Agra, and that Maurya in Patna offends her sensibility. This makes the reading real and interesting. The book is lucid and captivating. Uncomforting truths linger in the background in a subtle silence, without dramatic turns. Tavleen talks about Nashta for street-kids, about soullessness of the rich in India (read the Vijay Mallya episode), the humane stories. She boldly mentions how India itself was in a way responsible for the broken tryst, lack of healthcare, infrastructure, education. We never as a nation demanded these building blocks for a civilized nation. She narrates the Rajasthan story when villagers said their lives are still as horrible at independence, with hospitals miles away, schools sub-standard. Still when asked who was best PM, they say, Indira Gandhi, because- She knew how to rule. Thus, the slavish obeisance made us love our leaders for crushing us and keeping us in perennial poverty. She is right in this respect. In a democracy, we as citizens cannot escape our responsibilities. We kept on voting for wrong people and even adored those who kicked us with their royal boots. We had no dreams and little demands. The book is captivating and bold. It is the book one should not read while walking in a hallway as one might hit the wall on the nose. I finished it in two night which stretched till almost the morning. This is the book which may wake us out of our slavish slumber. As we look back at sixty six years of mis-governance with leaders who treat the country as fiefdom with no accountability as they gave themselves one after another Bharat Ratna, without being questioned, we find we as citizens, voting wrong people, early as loyal subjects in awe of royalties, and later for color TV and now for free Wifi, we are as much to be blamed for the lost sixty years of sluggish growth, as those who ruled over us. We had lost our ability to dream, to aspire. Every nation gets the kind of government it deserves. My verdict: Read it to solidify your commitment to nation, to understand our errors of the past, so we are not doomed to repeat them. Read it for the captivating read it is and read it to understand how at individual level we can still contribute to the society through small initiatives. I rate it 4/5 because some places it looked prejudiced and I hoped more details on media. Many secrets are told as coming from sources which cannot be named.